TRIUMF Five-Year Plan 2010-2015: Building a Vision for the Future. TRIUMF, 2008. The Editors' Association of Canada/Association canadienne des réviseurs today announced the winner of the 2008 Tom Fairley Award for Editorial Excellence. Vancouver editor Melva McLean has been honoured for her pivotal role in producing TRIUMF Five-Year Plan 2010–2015: Building a Vision for the Future (published by TRIUMF). From a short list of four candidates, McLean was chosen to receive the award for her editorial contribution to an 850-page report for TRIUMF, Canada's national laboratory for particle and nuclear physics. The job took nine months to complete and involved 50 contributing writers. 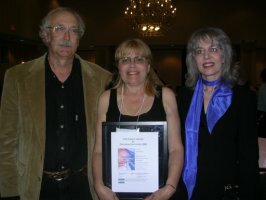 McLean accepted the $2,000 award at the Editors' Association of Canada's 30th anniversary conference banquet, held on June 6, 2009, in Toronto. The modest McLean gives other people much of the credit for the success of this huge project. "I had four assistant editors with scientific backgrounds and three proofreaders to help me," she says. "And the person in charge of creating more than 200 graphics and figures at TRIUMF never once sent me the wrong file." McLean also notes the strong and ongoing support she received from her co-editor, Timothy I. Meyer, head of strategic planning and communications at TRIUMF. 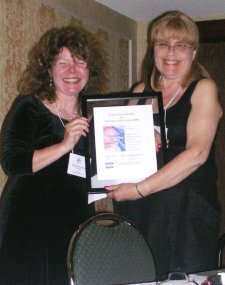 Maureen Nicholson (L) presents Melva McLean (R) with the 2008 Tom Fairley Award for Editorial Excellence. In the end, though, McLean's knowledge of the publishing process was a critical factor. She made some crucially important decisions as the project evolved, such as choosing a designer she knew could maintain excellent version control. "With 50 contributors, I knew this would be important," McLean says. "It is safe to say," notes one judge, "that there aren't very many editors who could handle such a large, complex and specialized project." McLean remains lighthearted about her significant achievement. "I have just started doing weight training," she says, "and the book weighs about ten pounds. I can use it when I do my workouts." Originally from Winnipeg, McLean moved to Vancouver to complete her master's degree in publishing at Simon Fraser University. She has been a freelance editor throughout most of her editing career, which began in the early 1990s. TRIUMF is a regular client, and she has also edited several books about food and wine. She was a judge for the 2003 Tom Fairley Award. The judging panel consisted of veteran editors Patricia Buchanan of Ottawa, Victoria Neufeldt of Saskatoon and Saeko Usukawa of Vancouver. The finalists for the 2008 Tom Fairley Award for Editorial Excellence were Robert Clarke of Peterborough for Gold Dust on His Shirt: The True Story of an Immigrant Mining Family by Irene Howard (Between the Lines); Andrea Ellis of Toronto for Bold Visions: The Architecture of the Royal Ontario Museum by Kelvin Browne (Royal Ontario Museum); and Leah-Ann Lymer of Toronto for Driven to Kill: Vehicles as Weapons by J. Peter Rothe (University of Alberta Press).